It’s sometimes difficult to understand what’s behind your cat scratching, or understand what you see on your cats body/coat so perhaps some of these photo’s can assist you. 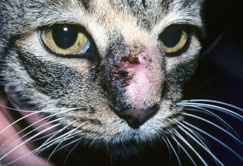 Your vet will be able to assist you with a special cream or shampoo or possibly antibiotics should their be a bacterial infection connected to the acne. Yeast infections are caused by a fungus and are also more likely in cats that have other medical problems. The ear is one of the most common spots for a yeast infection. 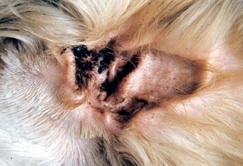 Symptoms may include a black or yellow discharge, redness of the ear flap, and persistent scratching of the ear. Yeast infections are easily diagnosed and respond well to treatment with an anti-fungal agent. 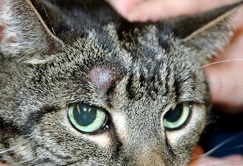 Ringworm is another type of fungus that affects cats, especially kittens under a year old. It causes circular lesions on a cat’s head, ears, and forelimbs. 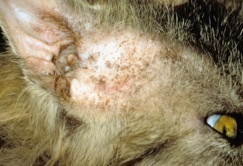 The skin around these lesions is often flaky and bald. 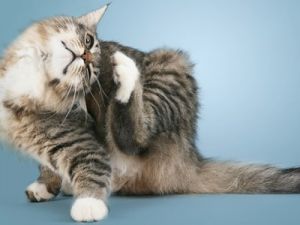 Ringworm is highly contagious and can spread to other pets in the home, as well as to people. Treatment depends on severity, but may include specialised shampoos, ointments, or oral medications. Yet another fungus, sporotrichosis produces small, hard skin lesions that may leak fluid. 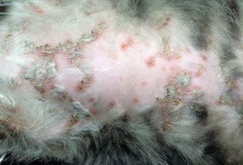 Sporotrichosis is considered to be a public health concern, because the fungus is known to spread from cats to humans. People with a compromised immune system are especially vulnerable. 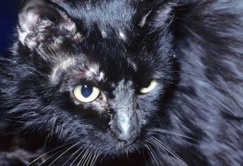 For these reasons, cats with sporotrichosis should be treated promptly, and caregivers should be meticulous about hygiene. Ear mites are tiny parasites that are drawn to the wax and oils inside a cat’s ear. As they feed, they cause inflammation that can lead to a serious skin or ear infection. Signs of ear mites include excessive scratching of the ears, head shaking, and a strong odour and a dark discharge from the ears. Suspect ear mites when both ears are affected. Mites can be treated with a topical product prescribed by your vet. 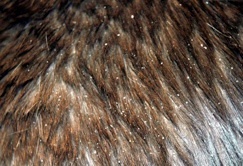 Lice are parasites that feed on dry skin. 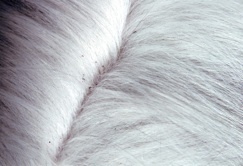 They are commonly found on older or diseased cats and often go unnoticed. 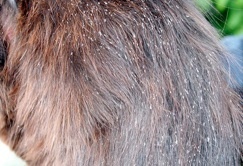 Large infestations can lead to scratching, restlessness, unusual coat appearance, and hair loss. Like mites, lice can be treated with a topical solution. Because lice are species-specific, you do not need to worry about getting lice from your cat. 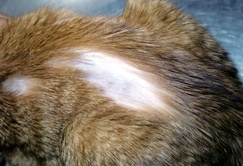 A lump in your cat’s skin is not necessarily cancer, but should be checked by a veterinarian. Older cats and those with white ears and heads are especially susceptible to skin cancer. To confirm a diagnosis of cancer, a biopsy is necessary. If the lump is small enough, a vet may recommend removing it in its entirety. For tumours that have not spread, this may be the only treatment needed. Cats are known to be fastidious groomers, but sometimes they overdo it. 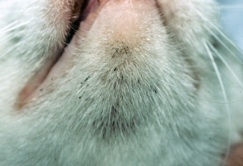 Compulsive licking, chewing, or sucking on the skin may lead to irritation, infection, and thinning hair (a condition called psychogenic alopecia.) Cats may groom compulsively in response to stress, such as moving into a new home, but may also over groom due to a medical problem such as osteoarthritis. If this describes your cat, talk to your vet about stress reduction and behaviour modification strategies. Thanks to Web MD for the use of these images and text.